← Endive and Blue Cheese Salad! To call this a recipe is almost a crime – there isn’t any real cooking involved, and it’s so easy our dog could do it if she had opposable thumbs. But, surprisingly few people actually know how to make hummus so we thought we’d share the recipe we use. We make this once or twice a week, we consume it with baby carrots, sliced raw zucchini and all sorts of other veggies. It’s a wonderful snack, and often is the one thing we grab when we walk in the door after a long day at the office. The history and debate behind Hummus is worth a read. Do what we do – toss the entire thing in the blender and go! 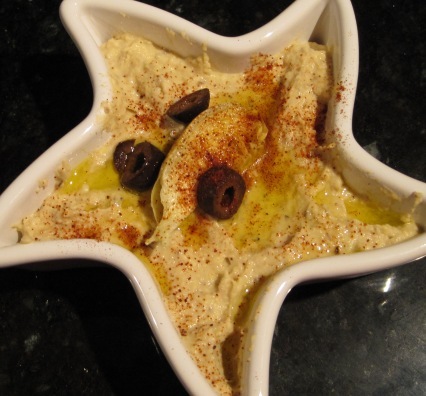 Place in serving bowl, and create a shallow well in the center of the hummus. Add a small amount (1-2 tablespoons) of olive oil in the well, add some whole pine nuts and sprinkle with paprika … because it looks pretty. I have to find the way to get the my hand oh tahini. Thanks for sharing. I have seen Tahini in the organic section of my gorcery store and in the middle eastern stores too! it’s also availbale online! haha, “because it looks pretty”, great ending to a simple but fantastic post. will be printing this and using it until i know the measures by heart (because i predict i’ll be making it as often as you guys do it).